Solid technology for 20 years, tried and tested, made in Germany, superior round brush technology, elegant appearance, robust and durable! VI3C is designed for use with the round brush. Here, we used a little more cleaning fluid and since it contains no wetting agents it remains a safe product to use and won’t damage your plates. In the round brush, the primary cleaning is not done by the bristles but by the turbulence of the liquid under the brush. So the plate grooves are flushed properly. It should never be used with both brushes at the same time as the normal brush would cause the liquid to accumulate, and the round brush would not work effectively. To use the soaking and swirling properly, it is important to apply the round brush longer than the normal brush. The VI3C detergent is almost odor free and designed specifically for our machines. It is characterized by having only minimal foaming and is therefore suitable for our round brush. Due to the low evaporation rate, the cost of cleaning is considerably minimized. Possible "groove noise" disappears and results in excellent sound. 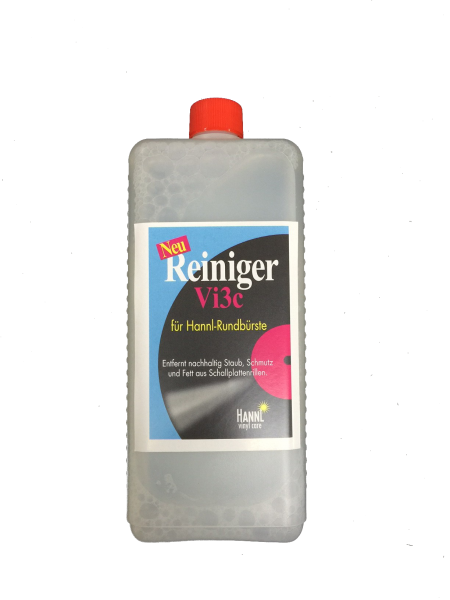 Related links to "Hannl Vl3C Vinyl DETERGENT (1L)"
Customer evaluation for "Hannl Vl3C Vinyl DETERGENT (1L)"
habe nach X2000 und Vi3lC nun auch dieses Reinigungsmittel getestet. Ich muß sagen der Geruch ist angenehm citrusartig und die Menge von 2 Litern reicht für ca. 500 Lp´s. Die Musikwiedergabe ist pur und unverfälscht, kann ich nur empfehlen. Subscribe to the free newsletter and ensure that you will no longer miss any of our demoshop offers or news. Live Act Audio tries to be accessible at these times in Sonthofen. Sometimes it is possible that we are not in office, cause of appointments at our customers - so we kindly ask for a prior contact via mail or telephone, if you would like to visit us.